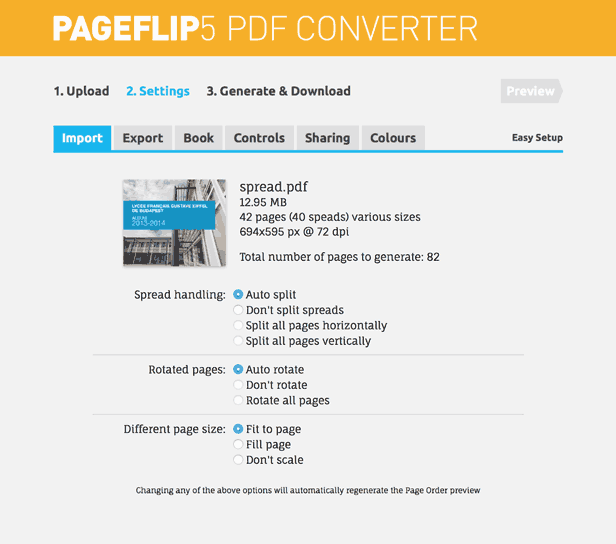 The online PDF converter is a tool that converts your PDF document to a Pageflip 5 book in minutes, ready to upload to your website. When you first load the online PDF converter to your browser, you're asked to enter your License Key, as the tool can only be accessed with a valid License. Upload your PDF file by pressing the "Browse" button, and select the file you wish to upload. As you select the file, the upload starts, and a progress bar is displayed. You can also specify a remote PDF file, by providing its URL. Press the "Get PDF from URL" button to start uploading the file directly from the URL. No progress bar is shown. As soon as the PDF file is uploaded successfully, processing of the PDF starts, a progress bar is shown, and you can see the preview thumbnails in the Page Order area as they are rendered. The PDF is processed automatically, rotated pages are rotated back to fit the page, spreads are split, and links are retrieved from the PDF original. Under this tab, you can see some useful information about the source PDF, like the file size, pixel dimensions, page count, and number of links it contains. You can also override here the default options of the processing of your PDF file: You can disable automatic Spread splitting, or if there is no spread in your PDF you can force split all the pages. It's the same for the rotated pages, you can disable page rotation, or you can force it for all the pages. Finally you can change the way the converter handle different sized pages: Fit on the target page, Fill the page, or copy the original page content without scaling. If you change any of the above options, the previews will be regenerated, and the size and count of the pages will be updated as well. On the export settings pane, you can set some important techncal parameter of the Pageflip book. These options depends on your target platform and evironements. You can choose from three predefined target screen resolutions, which is used as reference for the generated books: the Page size is calculated by keeping the original page aspect ratio, and making the book to fit on the desired screen size in fullscreen mode. If you select the bigger size, but want to targed smaller screen resolution, don't worry, the book is autmatically downscaled, and the zoom function become active to view the book in its full size. Higher set this option, higher will be the quality of the rendered pages, and slower will be the rendering time. If you need precise font rendering, you will need the highest setting, but if you work only with images, a lower option should be enough. The content of a book can be saved in an external file, or embedded in the main html file too. If you taget an offline platform, and want to be compatible with all the supported browsers, then choose embedded (offline compatible) mode. It is up to your preference, you can set where to save the external contents (like HTML content file, and the page/thumbnail images). You have to set the target domain on which you want to use your Pageflip book, if it is not set correctly the book will not appear on the page. If you choose online, you need to enter the domain(s) without "http://www. ", but with subdomain (if any). Set a copyright text, that you can optionally display below the book.